This is the only time it's acceptable to rock out the 'shut up and take my money' meme. 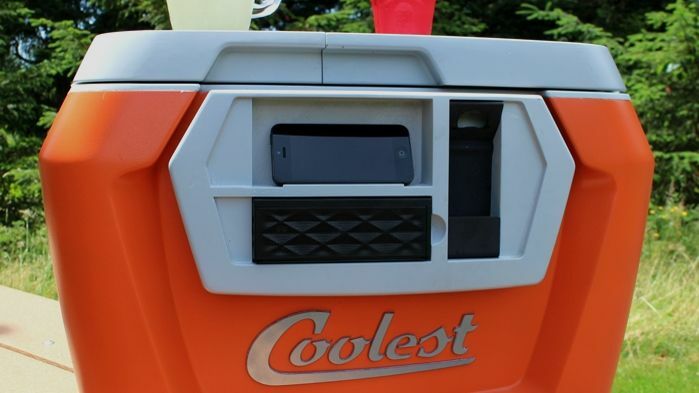 'Coolest' - the incomprehensibly useful high-tech picnic cooler - has destroyed its lowly Kickstarter target of $50,000 in just a day, with current backing totaling at just south of $1.8-million. Unimpressed with the bog-standard coolers available on the market, project founder Ryan Grepper decided to develop his own super-cooler, packed out with a tonne of bonus features. For starters, 'Coolest' has a built-in blender, so you can use some of the ice you're lugging about to launch an impromptu cocktail session. There's also storage for cutlery and plates, a chopping board, and a built-in lid light for those romantic picnics at dusk. It's tech-friendly too - the 'Coolest' ships with a USB port so you can charge your smartphones at the park, and has an integrated speaker system that runs off 30-ft range Bluetooth connectivity - summer tunes galore. Sounds like heavy stuff...literally. Fortunately, the 'Coolest' has two off-road wheels, a pull-up suitcase style handle, and cable ties so you can whack a shedload of gear on top. Grepper's a professional product developer, and he's eager to find new ways to party on the fly. "I'm always looking to maximize my fun when I get together with my family and friends. That's why I am so passionate about the 'Coolest'. I invent lots of things, but other than my Jello-shot catapult very few have brought so much fun to my life," says Grepper. Grepper actually built himself a rudimentary prototype long before 'Coolest' and Kickstarter campaigns. Long before the days of Kickstarter campaigns, Grepper actually built himself a rudimentary prototype, not knowing he'd one day be bring in millions of dollars with the 'Coolest'. "I know firsthand how much fun it is to have a cooler with speakers, and a portable blender for beachside margaritas, because I built myself one of each around ten years ago. Last year I reexamined these well-loved creations and realized just how much room for improvement there was. " You've missed the early bird price of $165, but you can still pick up a 'Coolest' for $185 (£110 ), although they chunk on a depressingly hefty $100 for overseas shipping. Head over to the Kickstarter page and see what all the fuss is about.